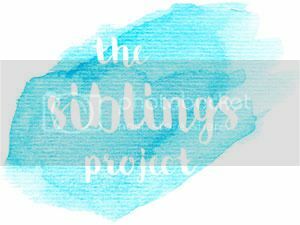 I haven't taken part in The Siblings Project, run by Dear Beautiful, for a long time. It's pretty difficult to capture all four of mine in one photo, so often the date for the linky whizzes by and I realise I don't have a pic for that month. However, last weekend I had the four to myself as Mr B was away for the weekend and I finally managed to capture all four. The circus was in town so we booked tickets to the afternoon show on the Saturday, not least because it gave us an incentive to actually get out of the house and do something exciting. 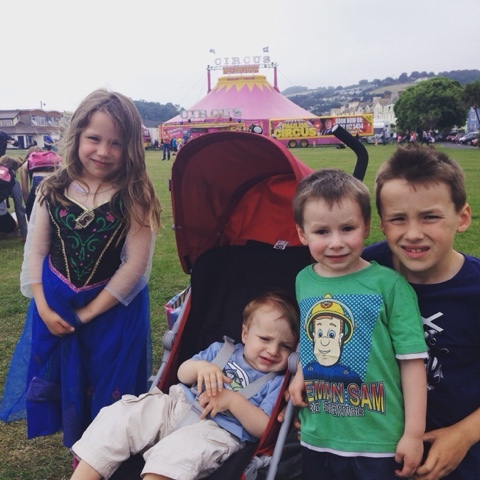 This photo was taken when we arrived outside the Big Top. The weather was actually a lot warmer than it looks in this photo, which is why they all look a bit grumpy - they're actually squinting in the light! Bea decided to dress as Anna for the day - simply because she likes Frozen. She is going through a real dress phase at the moment. I love the way Elliot (on the right) has his hand gently touching Wilf. He is a fantastic big brother and very caring and protective to his younger siblings. I was very lucky to get this photo of Wilf. He tends to avoid having his picture taken, if at all possible. He can be very reserved and normally has a hundred other things he'd rather be doing. However, since turning four a couple of weeks ago, he really seems to have grown in confidence and he's allowing more people to see his real character. Ossie is slumped in his pushchair because he's a bit tired. I had hoped he'd drop off on the way down to the circus, but instead he had a snooze during the performance. The show was really good fun. It lasted for about an hour and a half and included: magic; tight rope walkers; juggling with fire, balls and a drum set; acrobatics on high ropes; and a clown - the favourite with my lot. It's lovely to have a record of all the siblings together. I'm going to make a real effort to take more photos this month so I can join in The Siblings Project linky next month.